The Fourth of July holiday was coming up and Lila had a whole week's summer break from daycare. I decided to take a few days off myself and we planned a week long mother-daughter vacation in Minneapolis with my sister and her family. And as simple as it was, flying out to see family for a week, every bit of the vacation was new and fresh and magical as I saw it through my toddler's eyes. Even the airport train zipping to our concourse through the massive and headache-inducing Atlanta airport made her squeal in delight. Weary travelers standing next to us could not help smiling at that. The upper Midwest was cool and pleasant compared to Georgia at this time of year. 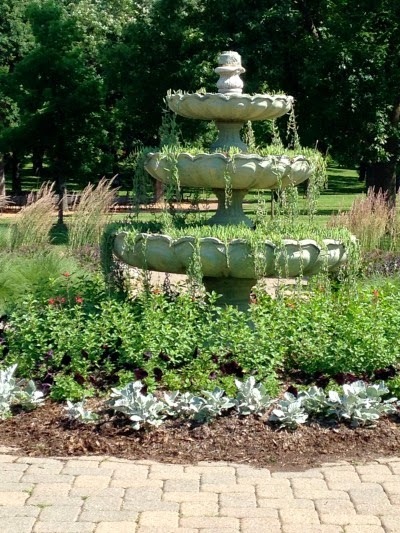 Minneapolis in summer is dreamy- there's no trace of the (in)famous wintry shroud, the skies are blue, the lakes are bluer, there are fresh, green spaces everywhere you look. Oh, and criss-crossing freeways everywhere too- I'm glad I don't have to drive in that city. Armed with a toddler each, my sister and I managed to squeeze in a lot of fun into one week. So here's my list of Top 6 things to do with a pair of toddlers in Minneapolis in summer! 1. 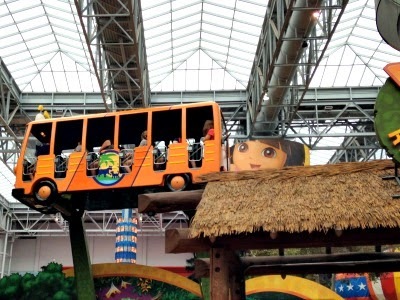 Go to the Nickelodeon Universe theme park inside the ridiculously huge Mall of America. Themes parks are so not my thing, Lila has no idea what Nickelodeon is, but this was a special experience and she thoroughly enjoyed it- even the fast and bumpy rides that left me queasy. They have a discount for toddlers on Tuesday. 2. Play in the sun and sand at Lake Calhoun's tiny beaches. 3. 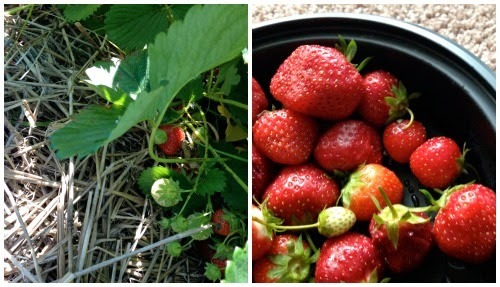 Go berry picking and later enjoy some fresh berries and ice cream. 4. 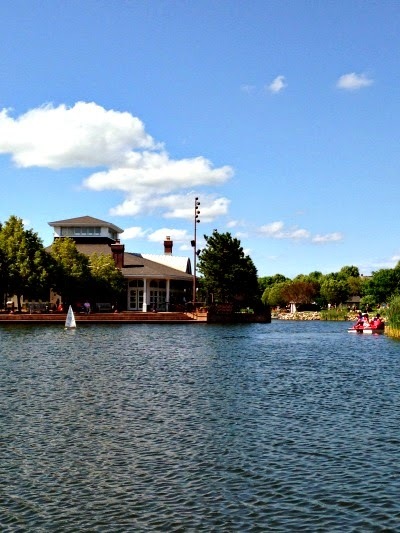 Walk around the Centennial lake promenade, then rent a paddle boat and get up close to the ducklings. 5. Explore the huge indoor playground at Edinborough Park; this is a perfect rainy day activity. 6. 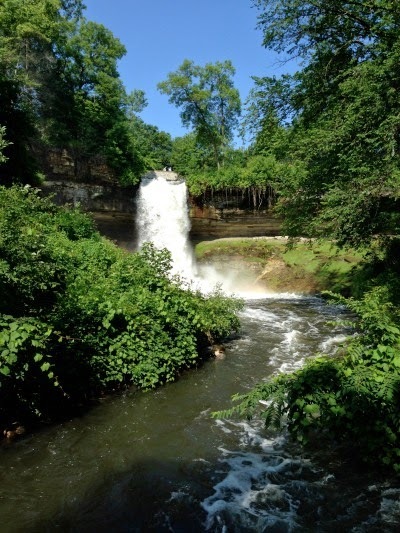 Go see the spectacular Minneahaha Falls and dip your toes in the cold, gushing water of Minnehaha Creek. Apart from these excursions, we enjoyed the things that are perpetually fun for the kids: walking to the local playgrounds, exploring the public library, coloring and painting, watching a few cartoons, swimming in the pool at the apartment complex, all while enjoying the excellent meals that my sister made. Among all these child-centric activities, my sister and I did manage to make a trip to a huge fabric warehouse called SR Harris, packed floor to ceiling with fabrics and notions. I could have easily bankrupted myself there so it was a good thing Lila demanded that we leave after a couple of hours. And we ate a hearty brunch at the French Meadow Cafe- their huevos rancheros were terrific. I am such a homebody and loathe to travel, but I am so glad we went on this trip. It was a fantastic bonding experience all around. Before my trip, I gathered up some small gifts to take with me. I never know what to get my brother in law, so he got the food gift, which experience tells me is usually welcomed and relished. I'd already made biscotti, brownies and candy for them. At quite the last minute, I started looking for a recipe for something new to make and hit the jackpot with this cookie recipe from Alice Medrich. Her cookbook Sinfully Easy Delicious Desserts has been sitting on my bookshelf for a few years- I won it in a giveaway in St. Louis. The recipe I fortuitously found is called Right-Brain Nutty Butter Cookies. Medrich calls them right brain cookies because they are cookies for cooks, not bakers. You can get away with less-than-precise measurements and the recipe welcomes the tweaking and "little bit of this-and-that"ing that cooks tend to do. The basic recipe is for a shortbread and there are no eggs involved. The entire cookie dough comes together in a couple of minutes in a food processor. The cookie is dead easy to make and requires basic pantry ingredients. But do plan ahead- Medrich notes that the cookies are significantly better if you make and refrigerate the dough 2 days prior to baking. And the cookies themselves taste better the day after they are baked, they last for a month in an airtight container. How perfect to take along on a trip! I'll tell you exactly how I made this batch of cookies. 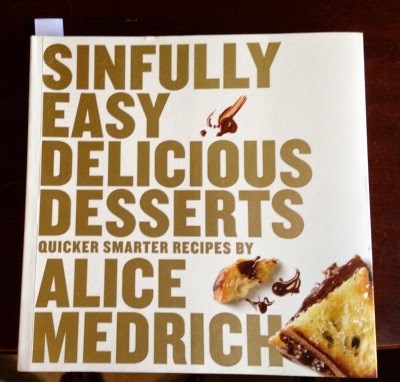 Look for Medrich's excellent book for the detailed recipe and all the variations. She's a truly gifted dessert chef and I should use this book more. 1. Start with 1 box deluxe mixed nuts (8.75 oz). These have cashews, almonds, brazil nut, hazelnuts and pecans, they come roasted and salted in a small canister in the snack aisle of the supermarket. 2. Pulse the nuts (all the contents of the box) in a food processor to a coarse chop. Dump them out and set them aside. 4. Add 1 stick (8 tbsp.) butter (cut in chunks and softened beforehand) and 2 tsp. vanilla extract. Process until a cookie dough forms. 5. Pulse in the chopped nuts. 6. Divide the dough onto two pieces of plastic wrap and pat into 2 logs. Wrap and refrigerate for 2 days. 7. Preheat oven to 350F. Slice the log into 1/4 inch thick cookies and bake on parchment lined sheets for 12-14 minutes. Cool on the sheet. Store cooled cookies in an airtight container. These cookies were a hit. My brother in law said they reminded him of cookies from Karachi bakery, which is apparently a celebrated bakery in Hyderabad. In any case, they are rich, tender morsels, slightly sweet and pretty much guaranteed to please. I'm glad to have one more food gift in my repertoire. Have you been traveling this summer? Vacationing while visiting family are the best kind of vacations! I am quite the opposite when it comes to travel. We also take any opportunity we get to travel. The husband loves driving and I love seeing different places. It is fun to see different places, and I was traveling after nearly a year so this was a welcome trip. Nice to know that you had a gala time with your sister and family. Nupur can you please share some easy recipes for travelling purposes. While I love the Indian railways the food on offer is downright pathetic. Worse it is outsourced so over charged and unhygienic. some times a train journey lasts for almost 48 hours. Thankfully i do not have to travel from Kashmir to Kanya kumari or it would have taken way longer. I take basic parathas and lemon rice but I am a little tired of it and they do not last more than a day. Hope you can help me when you have the time. Life has taught me to be patient. For a 2 day journey, intact fruits (apples, pears, banana, oranges) would keep well. Also, chivda (cornflake or puffed rice based) or trail mix (oat based) with dried fruits and nuts. Khakra (gujarati crisp flatbread) with ghee and dried peanut chutney. Peanut butter and jam sandwiches. Banana bread. But we've been taking in a lot of local happenings here- the local park Jazz series, the family free symphony specials in the city, some long due discover-your-backyard type neighborhood walks(we just decide in the mornings which neighborhood we want to discover and drive unto a point and then set off on foot and eat at any place that looks interesting and not chain-type place along the way). Next in order are short hikes thru the lovely bay area parks we have all around us. I loved your vivid description of Minneapolis. You totally made me want to visit the city even though I've somehow only ever imagined it in its winter avatar and the cold is so not my thing. And all those firsts for Lila, my oh my, what a lovely age it is to discover so many new things and be delighted by them. I will remember Lil Lila's enthusiasm as I take in some new stuff this summer and chide myself if I act jaded or indifferent like I'm wont to do sometimes. Isn't it lovely for Lila to be growing up a plane ride away from her maushi? And your cookie recipe went right into my ever growing list of foods to make this summer. They also sound perfect for gifts I'd like to make to a few kind teachers of V when school reopens. Have a great rest of the summer. And a high five to Duncan. Hope he snoozed, and snoozed and snoozed. Ooh Maui does sound dreamy! I'm with you on enjoying local events. There's so much to see and do where we are and we haven't even scratched the surface yet. MN is quite horrible in winter, I'm told but that's why summer is a big celebration there. The cookies are indeed good teacher/hostess gifts and the like- a rich and gourmet taste which satisfies in small bites. You have a wonderful summer too! If I wouldn't have been a mother of hyperactive toddler, I wouldn't have realized what level of hard task you have accomplished. It sure is a success story of a type :) Loved to read your fun moments and nice capture of all snaps. 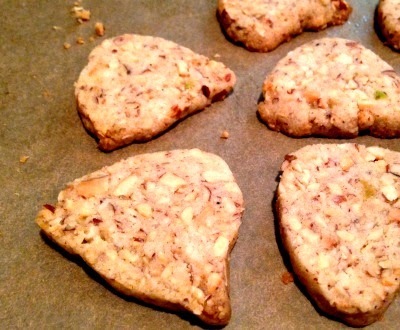 Cookies seem fully loaded with nuts, over the weekend I baked simple wheat cookies for my son. But with his bunny teeth he could only bite it and couldn't chew totally so split it later. I thought wheat would be healthier hence avoided flour. Do you know any good teething type of cookies which does not need molar chewing something similar to parle-g which melts in your mouth.. I don't know of any teething cookie recipe but I bet there are dozens of versions posted online! Try a shortbread recipe but made with whole wheat flour perhaps? Sounds like a fun holiday - I love seeing the world through sylvia's eyes - makes plane travel better except when it is long long long and for a child this gets even longer (I am talking 24 hours flights!). 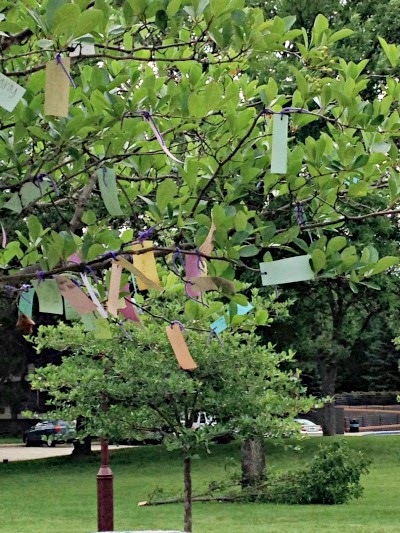 Love the photo of the wishing tree - we saw one last week but it was just hung on a few wooden arms in a museum - the kids loved it. Ah, we are planning to visit India in a few months and I am very apprehensive about two long haul flights! This time the flights were only 2 hours each so it was a breeze! Those cookies sound yummy I must make them. I didn't travel but infact was home alone and upto a whole bunch of interesting things. I started retailing my desserts at a local shop and am experimenting with new flavors in bakes. How nice that you have your sis in the US now and the wonderful time you all had together. I love your entrepreneurial spirit, Anjali! Mumbai is a foodie's city so no doubt you'll thrive there. This is such a fun holiday and lila is indeed a trooper!!! Spending solo time with mom and sister is one of my favorite ways of spending time! Whenever I get together with my mom or sister, we talk non stop and my husband gets so surprised that we have so many things to 'still' talk about after talking on the phone every other day! This post made me miss my sis even more! We did some travelling this month..nothing major..just a short road trip to a nearby state park, hiking, staying in downtown San Fransisco in a nice hotel! was a lot of fun. Lila was really cooperative and sweet, it was such a relief. San Francisco sounds lovely, that's one place I would love to visit sometime. Looks like your sister and family took you to the best of places. I love the food at French Meadow Cafe..So glad you had a good time! I LOVED your city :) We did manage to squeeze a lot in, but there's so much more to see and do in MSP. Your Fourth trip sounds wonderful! Thanks Nupur! I meant to write 'Door' County and Lake Michigan! LOL. R- I was thinking that you all would be on cloud 9 after Germany's victory. My neighbor flew the German flag and all! Your family vacation sounds wonderful. The National Parks I would love to visit, maybe one per year when Lila is a bit older. We took a week long road trip from Ohio to Virginia. We usually plan last minute and just drive. We loved the mountain views with thick greenery all the way. We all love nature and enjoyed our drive. In Virginia, we visited Jamestown, Yorktown and Norfolk Navy Museum where we toured USS Wisconsin warship. Amazing experience !!! We loved all these historic places. Hope you and family enjoy rest of the summer...hugs to Lila. How lovely, Meena! I feel a bit queasy in cars so road trips are never that much fun for me. But I can see how exciting it is to discover these cool places along the way. We'll have to go blueberry picking soon- they are in season here as well. Enjoy the rest of this summer! That sounds like a splendid trip. Love the photos, too! And, the cookies sound just yummy. We're not traveling this summer -- saving all that energy for our September trip to England. I've been totally enjoying your England related posts, Joy! I lovr Karachi Biscuits....so this is a definite try!!!! Let me know if the recipe works for you! Hi Nupur! You were in Minnesota, practically next door! It's been years since I visited MInneapolis, but I well remember the beautiful lakes and parks. Sounds like you made the most of it! Your part of the world is so beautiful in summer, Linda! Could you please do a post on toddler food/snack options when you get a chance? My daughter doesn't eat cereal or oatmeal as she hates milk. And those are mostly the options at her daycare. So I try to give her something at home like pancakes or grilled cheese sandwitch in the morning but I run our of options sometimes. Can you suggest a way to get some milk in her and some finger foods please? What does Lila like to eat? Is she a good eater or a picky eater? Iris- I personally don't think there's anything special about milk. I'm quite indifferent to whether my child consumes milk or not. As it happens, she does like a small portion of milk with homemade chocolate syrup. And she does like plain yogurt with meals. My sister has a picky toddler and he likes milkshakes with fresh fruit (strawberries and banana being a favorite). Those are quick to make in the blender. I consider toddler food to be nothing but smaller portions of whatever adults eat, and snacks to be nothing but small meals (as in, snacks don't have to be junky stuff like crackers and cookies that are marketed as toddler snack food). And breakfast doesn't have to be breakfast foods, it can be just another meal. Some specific suggestions for finger foods: hummus with veggie sticks, vegetable patties, granola (made with oats, nuts, seeds, dried fruit) can be eaten plain without milk or with almond milk, mini quiche, roasted sweet potato. Good luck!! That makes me feel better! :) I will definitely try the suggestions. Thanks Nupur! This thank you note is due for a while. I tried your cookie recipe and its big hit! Have baked big batches since then. I used whole wheat flour. And it's a healthy snack!